We the church are comprised of saints on the move. Our feet provide useful service in bringing us where the LORD wills as we walk in the Spirit (ISAIAH 52:7; GAL 5:16), to deliver the message of the Gospel to a dying world, a planet of walking (EPH 2:1b; spiritually dead) corpses. We are the couriers of Christ Jesus delivering the diplomacy of peace from the King, offering official entrance and citizenship to all who would desire to live in His Kingdom! The church is partaker of these first fruits of peace, for it’s not until we receive this peace that we can offer the same to others, and this peace is acquired only by the Gospel of Jesus Christ. All Christians, true believers and followers of Jesus Christ, who have repented and turned away from their old, sinful lives have had their sins judged by God already: at the cross of Jesus Christ where He died for our sins! Because we received and trust in this spiritual Truth, we are not under the wrath of God (in judgment), but rather have peace with God, all on account of Jesus; the Lamb of God Who takes away the sin of the world! Look throughout the New Testament and search for that word “peace” and seldom will you encounter it without the word “grace” preceding it! Indeed, we cannot experience peace with God until we first partake of the grace of God! By the shed blood of Jesus, the wrath of God is appeased. For those who are covered in that Holy Substance, we are now at peace with Him, reconciled to the One Who would have been a Divine Judge upon our sin, and Who would have rightly condemned us to eternal hell. We are reconciled to God! That is, a dramatic change has taken place, for if we receive the propitiatory (satisfactory) sacrifice of Jesus Christ for our sins, the justice of God against sin is met, for the LORD took our sins and infirmities (ISAIAH 53:4-8,10-11) and has set us free from condemnation (ROM 8:1), Himself being condemned in our place (ROM 8:3; 2 COR 5:20). Note: Since we were at enmity with God as sinners, it is we who were in need of reconciliation to God and not vice versa; God is Holy and Righteous and has no need to be reconciled to us for He committed no offense against us. We are the ones who have offended His Holiness by our rebellion and sin, but God has provided reconciliation through His Son. The reason I bring this up is because many who believe in Universalism, that is the false doctrine that all souls will eventually be saved, believe that reconciliation is bi-lateral, that God and we ourselves are reconciled to each other, so that all will come to know salvation. Such is the teaching in William P. Young’s novel, The Shack. However peace with God is only the beginning for His beloved! There is far more still! We of the church not only have acquired peace with God, but also the peace of God! This is a peace sublime, unequalled by any other, no matter how euphoric or exquisite: all other forms pale in comparison to this Divine supplement for our souls! The very essence and attribute of peace, from the eternal serenity of the Spirit of God, embodied in the Person of the LORD Jesus is shared by Him to the church and is of the same quality. It is as we continue in the grace of God, and enjoy peace with God, and partake of that sweet fellowship with our dear LORD, sowing in the Word (PSALM 119:165; JOHN 14:27) and prayer (ISAIAH 26:3; PHIL 4:6 [in this passage “careful” meaning “anxious”]), that we likewise reap the peace of God. This peace runs deep within our hearts, far deeper than any mere emotion of the soul, and abides irrevocably for those that abide in Christ (JOHN 15:1). It is in the midst of trial, of hardship, of abject poverty, misery, persecution and tribulation and all the “slings and arrows” of life that this peace yet abides, for it’s entirely independent of our circumstances and happenings, and our thoughts and feelings. This peace is quite able to keep our hearts and to rule (to designate, decide, direct, to govern the heart) so that no influences will govern with greater power than this. The peace of God shall govern our hearts beyond the abilities of all other considerations, all other powers and influences that may afflict us and attempt to bring us to despondency or despair! Note that thankfulness is also associated with the peace of God. (see ROM 1:7; 1 COR 1:3; 2 COR 1:2; GAL 1:3; EPH 1:2; 6:23; PHIL 1:2; COL 1:2; 1 THESS1:1; 2 THESS 1:2; 1 TIM 1:2; 2 TIM 1:2; TITUS 1:4; PHILE 1:4; 2 JOHN 1:3) and allow Him to have His way with our lives, “delighting in the LORD” our God (PSALM 37:4). This is our sure footing; our steadfastness depends upon our stability in the Gospel, for if we are faulty in our understanding and application of this foundation, then we as warriors will be easily toppled by our enemy. Just as the “stone cut without hands” struck the image (representing the world empire in DANIEL 2) in its feet and caused it to crumble; so too when the enemy strikes us at our feet and if we are not suitably founded and armored with the genuine Gospel (and not one of its myriad counterfeits that we see multiplied today) we shall crumble. These shoes are where our walk as believers makes contact with this fallen world, and our testimony will either validate or invalidate our message (the message of THE Gospel can never be invalidated, only our message, our delivering and presentation of the Gospel runs this risk); too many evangelists and proclaimers of the Gospel today have tainted testimonies, smudged with sin and tattered with transgression. Pure religion, among other things (in its biblical sense) “is to keep ourselves unspotted from the world” (JAMES 1:27). This world needs to see holy saints of God, whose lives rightly reflect the glorious Gospel of our Holy God and LORD; only such consecrated vessels are suitable to carry this pure Gospel, and apart from the grace of God, none of us would be suitable! Yet this grace is only effective in willing hearts; yielded to God, and yearning for His Life in us and we must likewise reject our own lives of carnal existence (or at the least, lives of mediocrity and ‘half-way obedience’). On a side note: The televangelists of today in larger degree have brought shame upon the Name of Jesus Christ, and upon this Gospel of Salvation by replacing God the Son with the ‘little gods’ that they claim as themselves and with such messages that promote lusting after the riches, possessions and things of this world. The clamor and “itching ears” of America’s church for such teachings (1 TIM 6:5; 2 TIM 4:3-4) has spelled spiritual ruin for them, and all the while they boast of such god-like power, they are defenseless against the power of the enemy that has them bound up in spiritual pride and arrogance: this is the legacy of the Kenneth Copelands, the Benny Hinns, and such like of the Word-Faith Movement. While boasting of spiritual authority, they possess none from the LORD Jesus Christ. There are others who promote successful living as if it were a birth-right of the church, and seek prosperity and self-help theology rather than the pure milk, and the meat of God’s Word. Is it any wonder that the saints in the church today are anorexic spiritually speaking? Why there is no discernment within our ranks as to what is approved and what is not regarding doctrine (so-called) being extolled among the fellowships and ministries across the land? Jesus promised us that those who follow Him must deny themselves, take up their cross and follow Him to the death of self, of all ambition and self-will, and allow His life to be manifested in us for the purpose of GLORIFYING HIM, NOT IN CREATING A LIFE OF EASE AND PLEASURE FOR OURSELVES! Warriors for Christ, who live in Christ, follow after the KING as dead men who have arisen with Life Eternal coursing through their spirits, onto the battle field of this rebel planet with but a single determination, a solitary goal, a sole cause: TO WAGE WAR UPON A DEFEATED FOE, SMITTEN LETHALLY BY THE CROSS OF CHRIST, and TO RESCUE FALLEN SOULS FROM HIS LAIR! THIS INDEED IS WAR! 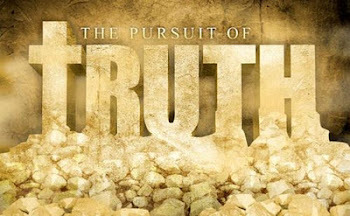 We who cleave to the Gospel of Truth are the only ones in the church that pose a threat to the kingdom of darkness! This Divine ammunition has proven lethal at depopulating that devilish domain of many of its slaves of sin, and for this reason the enemy would seek to cripple us so that we can no longer advance into his realm and rescue lost souls! The ancient soldiers of time past wore what were known as ‘greaves’, armor worn (typically) over the knee and lower leg to protect them from enemy attack. A strike to the shin bone would render a soldier ineffective and take him out of the battle. He would no longer be able to walk, much less fight! Sometimes traps were set by the enemy that would spring up and with a stone or ball of iron or brass would strike suddenly and cripple a soldier with a shattered leg. Likewise in our walks/lives the enemy would seek to surprise us and strike suddenly with a trap that would cripple our witness for Christ, and disable our testimony by getting us to fall into sin. Thus this preparation of the Gospel of peace is of extreme necessity. As already mentioned, a consecrated life is necessary, and this is the discipline of a soldier that marches to the order of his LORD, who cares nothing for the things of this world, or the allurements of sin, but whose heart beats fervently to hear the approval of the Captain of our Salvation: “Well done, good and faithful servant”! We must be able expositors of the Gospel and deft defenders (apologetics) of its Truth. This takes study, prayer, and biblical meditation on the truths of God’s Word: preparation in doctrine as well as sanctification as vessels unto honor. To walk circumspectly is to walk carefully, being completely aware of one’s surroundings and any potential dangers that might present themselves. Picture a soldier navigating his way through a mine field, and you will get the picture here; or as already mentioned an ancient soldier who is on the look out for traps that might ruin his leg and take him out of the battle. To step outside of the LORD’s will is to be endangered of stepping on such traps (“snares” DEUT 7: 16; JUDGES 2: 3; PSALM 119:110; PROV 29:25; 1 TIM 6:9), thus we require His wisdom, which He readily provides for all who ask (JAMES 1:5), and His Spirit Who alone can rightly lead us (ROM 8:14) through. Lastly, recognize that there are two shoes, one for each foot, and as we walk with God in this warfare, we require (as walking naturally does) balance. All our understanding of the Gospel, and of the Word in general, must be balanced and in proper proportion; we must rightly divide the Word of Truth and keep its sacred doctrines in alignment with one another. We must not be all about Truth to the exclusion of Love, and vice versa; we must not be all about holiness and not about mercy; we must not be all about doctrine and not about obeying such; we must not be all about the study of God’s Word and not about prayer! Likewise in warfare, any soldier of martial prowess will tell you that in engaging the enemy one requires good foot work, balance, and sturdiness and solidity of strength. Thus we are equipped with the best footwear that any could ever possess! The LORD Jesus is the sole object of our faith, and as we remain steadfast in “the faith” that is, in the teaching and application of God’s Inspired Word after the Spirit Who dwells in us and inspired the scriptures as well (ROM 10:17; 2 COR 13:5), we abide in the Incarnate (made flesh) Word, and He in us! The allegorical designation for faith here in the passage of EPH 6:16 is a shield; it represents the only movable defensive part of our armor. We can rightly deduce that “the faith” is applicable to all of our lives (2 PET 1:3; 2 TIM 3:16-17) and readily available for any and all aspects, just as a shield might be positioned to protect any part of our bodies. In ancient days, there were two basic kinds of shields: bucklers and flanking shields. The buckler was much smaller, usually round, and efficient for its maneuverability but not sufficient for full body protection. 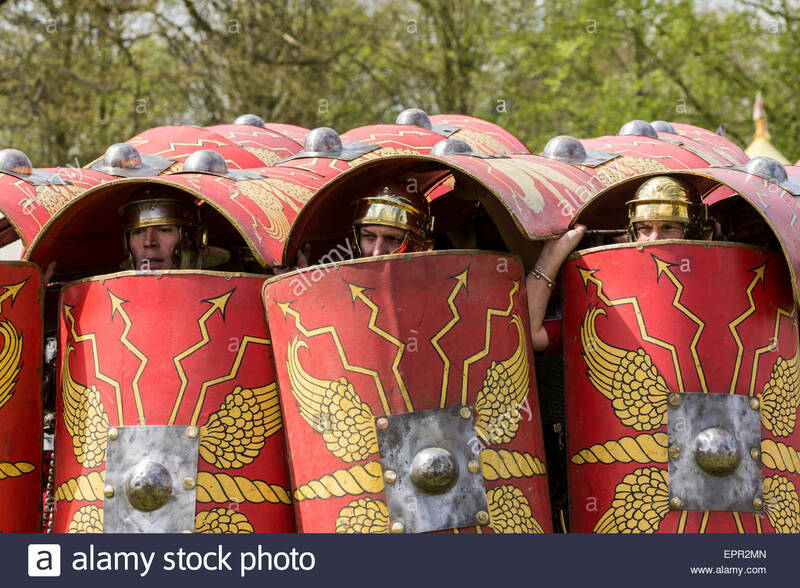 The flanking shield however was quite large, almost door sized, and particularly in the Roman (and previously Phoenician) armies had ridges along its edge so that the shields could be interlocked between soldiers (hence the term flanking shield) to form a wall of protection. The Greek word used here for “shield” is thureos, meaning an oblong, large, door-like shield that protects the whole of the soldier at once. of the arena battles with the chariots. The gladiators hunched down and locked their shields to form a dome shape, impervious to attack (when done correctly). The full sized flanking shield is suggestive that this faith – in God’s Holy Word – is suitable and practical for all our lives and its aspects; that everything is covered by this shield of faith. Also the idea that we can use these shields in conjunction with others demonstrates that my faith may be of service to you, and your faith of service to me, that the entire body is edified by the mutual faith of its individual members (see MARK 2:5; ROM 1:12; COL 3:16). The entirety of the Christian’s walk is to be in accordance with faith, specifically faith in Christ Jesus and His Word. By employing such, the believer is ‘shielded’ from the attacks (“fiery darts”, to be examined momentarily). 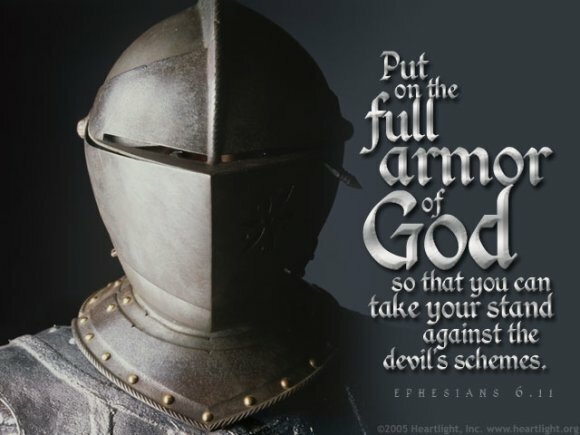 Our approach in the Christian life is based on living by faith, for only this can and will please God; anything less than an all encompassing faith is sin, and will bring the saintly soldier into the flesh (not the spirit), the arena of the enemy where he is vulnerable to the strikes and wounding from Satan. See also: HAB 2:4; GAL 2:11; HEB 10:38; ROM 14:16, 23, JAMES 2: 19. This faith is to be evidenced in genuine salvation (not mere profession which James dealt with in JAMES 2:19 above) that will produce fruit of the Holy Spirit (GAL 5:22; EPH 5:9) and good works (EPH 2:10; 2 TIM 3:17; TITUS 2:14; 3:8,14; and 1 PET 2:12). Note that such fruit and good works are not necessary FOR salvation, but are necessary as evidence OF salvation. Without such evidence there is no substantiation for assurance in one’s salvation, hence the many warnings found in scripture (LAM 3:40; 2 COR 13:5; GAL 6:4; HEB 6:4-6; 10:23, 26-31). Remember the words of the LORD Jesus Christ – “…you shall know them by their fruit…” – MATT 7:16-20. How much faith do you have in God? One might well answer that question by asking another: How much do you love God? Your faith or trust in a person will grow in proportion to your love for that person. How much more so will our faith in God grow as our love for God and His precious Word grows? Apologetics, the defense of ‘the faith’ that provides reasons why we believe the Bible is God’s Word and substantiates evidences that prove such and excites faith in the scriptures. Thus in defending the faith, we plow the soil of human hearts, preparing them for the seed of the Word, and as they express faith in the Word towards salvation, they themselves are defended by that same ‘believing faith’. Have a look at this exceptional apologetics ministry, www.CROSSEXAMINED.org And visit their youtube channel here. 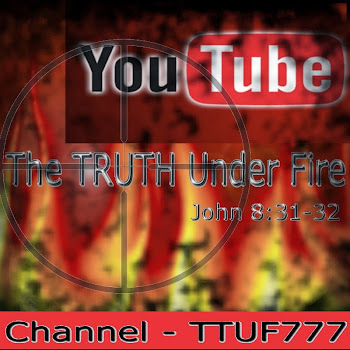 These arrows, spears, missiles of the enemy are tipped with an iniquitous fire that inflames, and if left unchecked will burst into flame and consume and ruin us by whatever means of sin that proves effective against we Christian warriors. The enemy has a vast assortment of weapons to engage us with, not merely one or two different kinds of fiery darts, and not few in number either. The demon hordes of hell are virtually bristling with ample supplies of these missiles! None of these weapons can force the Christian into sin, but by means of temptations, allurements and lusts woo and sway us into the reckless domain of the flesh where we are then prone to sin. Thus this shield of faith is imperative, and of utmost importance for our protection! Just as every soldier would inspect their shields after every engagement in battle, checking them for weaknesses or breaches; we must also prayerfully examine our faith and determine (through insights provided by God in prayer) where any weaknesses are located and repair them. These fiery darts may inflame us towards doubt, therefore seek out the veracity of God’s Word and affirm by faith that which it declares. Likewise remember that God will ensure that our faith is tried and tested as He carefully places us in the furnace of trials and afflictions, for the purpose of refining, thus strengthening, our faith. Once completed, we are delivered from such trials and improved by them. Consider the three faithful Hebrew men, friends of Daniel the Prophet (DAN 3) who refused to bow to the image of Nebuchadnezzar and were judged by the king and thrown into the fiery furnace; yet they were not destroyed by those flames, but the ropes that bound and hindered them were! That’s God’s intent in these afflictions we face: that those things that bind and hinder us from doing greater exploits in His Kingdom are burned away and we are sustained and liberated by faith in Him! An Old Testament counterpart to this allegory of fiery darts and shields of faith would be the fiery serpents and the brazen serpent on the pole (NUM 21); because the children of Israel continuously murmured and complained about their situation in the desert, and longed to return to Egypt, God sent a plague of fiery serpents, symbolically representing sin. The remedy was to look to the brazen serpent which God told Moses to make. This was a rather odd remedy when one thinks about it; why didn’t God simply heal those whose hearts He knew were truly repentant? This method was quite prophetic and a type of Jesus Christ Who would bear the sins of His people (JOHN 3:14). Just as the Hebrews looked upon the brazen serpent by faith and were healed, so too the repentant sinner looks to the Cross and finds healing from the ‘serpent of sin’; likewise when the soldier of the Cross uses the shield of faith to quench the fiery darts of the wicked one he is kept safe from sin. “[. . . Reading this passage in NUM 21 we] make an important discovery. [We] notice that ‘look’ and ‘believe’ are synonymous terms. “Looking” in the Old Testament serpent of brass is identical with “believing” on the New Testament with Christ [HEB 12:2]. That is, looking and believing is the same thing. And [we] would understand that, while Israel looked with their external eyes, believing is done with the heart. I think [we] would conclude that faith is the gaze of a soul upon a saving God (PSALM 34:5; 123:1-2). In my own word-study of ‘faith’ I was astounded to discover that there were only three references in the entire Old Testament! What I discovered was that the Hebrew word for “trust” is synonymous for ‘faith’. F.A.I T.H. = Forsaking All I Trust Him. So faith is likewise a power, they say, we can also employ to create our own reality, through our own spoken word (as gods, created by the Almighty God). Wrong! It’s by faith we comprehend, understand, perceive that all that is created, was done by the Word of God! We trust that it is so, because the scriptures reveal these truths to us, and thus we rightly glorify God for His creation. Note that hearing comes by the Word of God; this sort of “hearing” implies an attentive audience towards that which is being heard, resulting in a decisive action of some sort. A courtroom hearing is an excellent example for this. After hearing all the evidences attentively, the jury is asked to make a decision based on said evidences. In the biblical instance, the action taken is faith itself; after hearing (a spiritually imparted ability by the Holy Spirit) the Word, one acts on faith and believes what is heard. “Have faith in your faith”; an obvious biblical error. One cannot have faith in one’s own faith (trust in their own trust) any more than one could carry their pail in their pail. Faith is a vessel of sorts that contains the received Word, and an attitude of action: believing and conducting oneself in accord with that belief! It’s interesting to note that in the scriptures, the action of believing faith is akin to obedience, such as the faith that motivated Abraham to offer up that which was most precious to him, his son Isaac (HEB 11:17)! Review the 11th chapter of Hebrews and witness the powerful faith of the saints, and how this was in direct proportion to their obedience to God! (MATT 17:20)! The power is not in the faith, but rather the One in which the person places their faith, be it small or weak (MARK 9:23-27). Note that the first three implements of armor relate with one another as these are things that the warrior-saint has: “having . . . girt with truth” and “breastplate of righteousness” and “feet shod with the Gospel of peace”. Then there are the next three implements which are likewise related to one another: the shield of faith, the helmet of salvation, and the Sword of the Spirit and these are things that the warrior-saint is to “take up”. It appears that the first three implements of truth, righteousness and the Gospel are already possessed by the believer as a part of their inherent spirituality. “Having” these things we are to be wise and faithful stewards of God’s provision of truth, righteousness and the peace of God by reception of the Gospel. Faith is something we must constantly employ for a saint can either act out of belief or unbelief given any circumstances of varying degrees of challenge. This call to action must be born out of willful obedience; otherwise any such faith is without effect or merit. As James indicates, “faith without works is dead, being alone (see - JAMES 2:20,26). The salvation of the heart, which is the spirit of man, is granted and possessed by the believer in Jesus Christ in the form of justification (salvation accomplished and deliverance from the penalty of sin); yet this armor has a helmet of salvation, which of course is worn on the head (ergo to protect the mind) and deals with sanctification (salvation in the process of accomplishment by becoming more Christ-like in thought and deed, and delivers from the power of sin). This is something the saint must endeavor by submitting their will to God; so likewise must the warrior-saint take up the Sword of the Spirit both in hand and in heart. Speaking of the Sword of the Spirit, this primary implement is a weapon, not armor specifically and it is both defensive and offensive; it along with the shield of faith is borne by the warrior saint, one in each hand. Just as a soldier would employ both of these in any martial engagement, so too must we hold the Word of God, and “mix” it with faith (HEB 4:2). By our faith in the Ultimate Spiritual Warrior, the LORD Jesus Christ and in His Divine protection we are safe from any onslaught of the enemy; simultaneously we engage in the offensive by the lethally effective and powerful Sword of the Spirit. Here ends this second section of the armor of God that has dealt with the shield of faith and the feet shod with the preparation of the Gospel of Peace. In the third upcoming section we will examine the helmet of salvation and the sword of the Spirit. The last section dealing with the armor of God we will examine another formidable weapon that is many times overlooked by biblical commentators, that is, “all prayer” as found in vs. 18. Concluding this study in Spiritual Warfare and the Armor of God, we will examine various lessons from the Old Testament that reveals more about the spiritual domain and the kingdom of darkness that we are set against, and then some practical applications on how to recognize and engage in spiritual warfare. Until then may the LORD Jesus bless you abundantly in the supreme victory He has wrought for us, His body and beloved bride!